Understand brand strategy through workflow, list and pyramid diagram. Here are some visuals that can simplify the understanding of brand planning and building. Learn an effective and easy way to create and apply infographics in presentation. More preparation may quicken the speed in doing work just like grinding a chopper will not hold up the work of cutting firewood. There are five simple questions to ask before starting your brand plan. 4. What about you and me? What kind of association and how much of a connection? If you don't have much energy and require more professional brand planning, seek for service provided by specialized brand planning companies. Those companies with experience, expertise and good reputation in this field can be trusted. 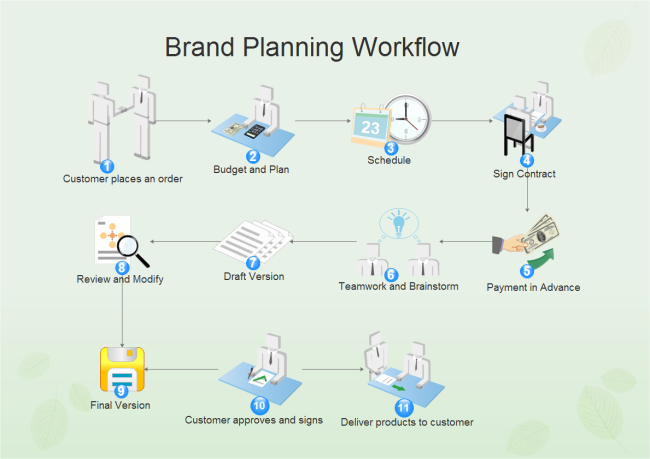 The workflow diagram below is concise and vivid in meaning, showing the general process of brand planning service. Building a strong brand can be thought of in terms of a sequence of steps, in which each step is contingent on successfully achieving the previous step. Implementing the four steps to create the right brand identity, brand meaning, brand responses, and brand relationship is a complex and difficult process. To provide some easy-to-understand structure, it is effective to think of sequentially establishing six "brand building blocks" with customers. To visualize the sequencing involved, these brand building blocks can be assembled in terms of a brand pyramid. Click the picture to view full version. Brand Salience relates to aspects of the awareness of the brand, for example, how often and easily the brand is evoked in different situations. Brand Meaning consists of two major categories of brand associations that exist in customers' minds related to performance and imagery. It is about the core value of brand. Brand Responses refer to how customers respond to the brand and all its related activities and information. In other words, what customers think or feel about it. Brand Judgments are mainly about customers' personal opinions and assessment with regard to the brand. It is closely related to brand reputation. Sometimes, the brand can be best promoted by "word of mouth". Brand Feelings are customers' emotional responses and reactions to the brand. 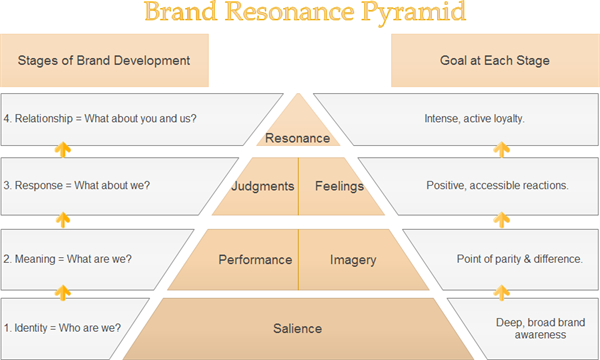 Brand resonance refers to the nature of this relationship and the extent to which customers feel that they connect with a brand and feel "in sync" with it. With true brand resonance, customers have a high degree of loyalty marked by a close link with the brand such that customers actively seek means to interact with the brand and share their experiences with others. The above diagrams are built by Edraw - an all-in-one visualization software providing various diagramming solutions, including mind map, flowchart, org chart, UML diagram, line chart, Venn diagram, floor plan and so on. See its intuitive interface as show in the following illustration. 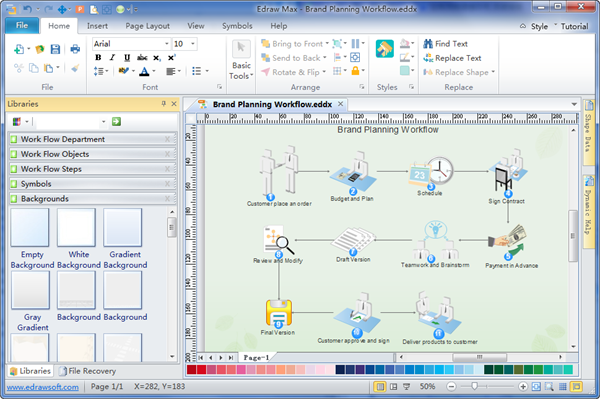 Since it can be exported into PowerPoint format, Edraw can be applied to create presentation slides, too. Some presentation templates are also built in the program.